Jean's Fine Rock Acquisition Service. Someone to learn from for sure. 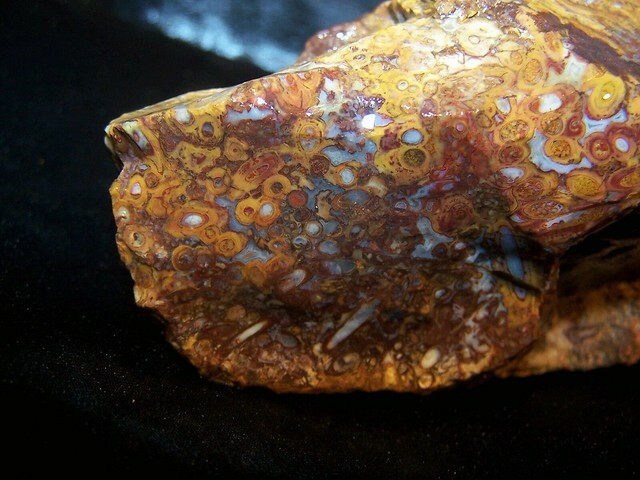 johnw , it is not easy to get really really nice agates. Especially larger pieces like the large crazy lace you are tumbling. One of the best sources is 'old stock' but old stock is just what the name implies. You about have to be friends w/the beholder or politically connected to acquire it. quartz sent me some unusually large snakeskin agates. I believe it came from an elderly friend who was unloading his collection. rockpickerforever shops yard sales and that girl sure does find some nice material for great prices. Much of it is from an estate sale where Grandpa stacked his old finds in the backyard and he has passed away. The kids(our age) are unloading our parents stuff as fast as they can get rid of it so they can sell his house. 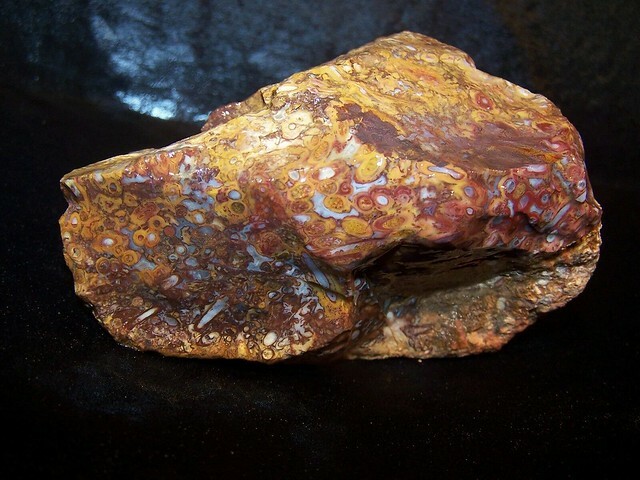 At Woodward Ranch are displays of incredible old large plume agates that were surface collected to extinction. In another 10,000? 100,000? years perhaps rain and wind will erode enough basalt to expose the next layer of them. The geologist said they are in the basalt from surface to 100's of feet deep. You make a good point. A good bit of the "Old Stock" material that is available these days is in the hands of old collectors or their estates. If one is patient and looks around they can be found. I am fortunate enough to have found a couple that I have bought from. The gentleman in Rusk has tons of material collected years ago by various folks most of which is no longer available and is priced extremely well, at $1 a pound for 80% of the material. I saw 2 or 3 crates that looked to be Zapata material and grabbed a couple of pounds. Lots of other material that I was un-familiar with. (definitely going back to see him when I can stay for a whole day. One prerequisite for acquiring this material is to be friendly and polite and helpful. One gentlemen who I have known now for over two years has a large collection of rough, mostly Texas material. Over this time we have developed a friendship, I call him once every 2 weeks or so to see how he's doing, ask a Lapidary question, etc,etc. When I make run up to get rocks, I am very careful to let him pick out which rocks he wants to sell, I don't start grabbing anything I see and I let him set the price which for me is a real bargain. He must have dealt with someone who got pushy and wanted to low-ball him, and he doesn't want anything to do with that type of person. Heck he ends up giving me some stuff every time. When i get there I always ask if there is anything I can do around the house. One day he asked if I could clean the rain-gutters out which I happily did, another time I trimmed limbs for him and drug them away. Almost always bring up food for he and his wife, Soup, smoked chicken, fresh garden tomatoes. I am getting to the point that although finding material myself is still fun ,it's a lot easier to pick up at the old collections. Just need to find them and in my case I have been very lucky. I have seen the displays at Woodward Ranch, quite amazing material. I wonder what has become of them. I just found that some people don't consider caddisfly larva to be disgusting. A French artist named Hubert Duprat uses them to make art. He doesn't make the art, the caddisflies do the work. Here's a death plate from Alpena, Michigan. This is limestone. Jugglerguy: Thank you for the image. I can definately see why its called a "Death Plate" but it in no way resembles this. Jugglerguy : wow,wow,wow, this guy does really fine work. I saw this before when researching caddisfly. 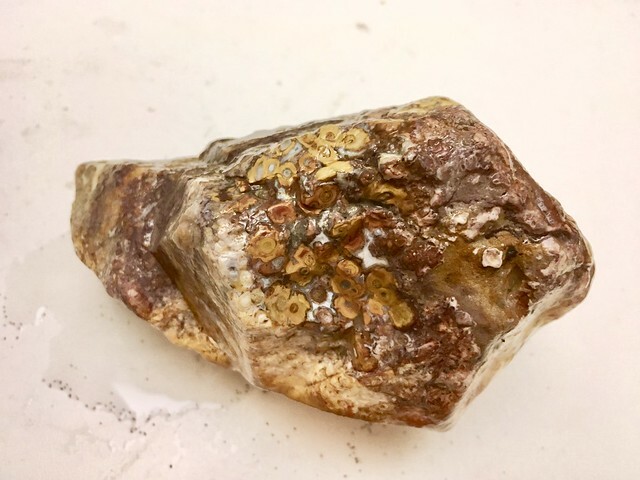 We gotta find those special caddisfly's, cuz when they take a dump it comes out as gold chips, gold shafts, coral, pearls, opals, turquoise. I just wonder how he trained the caddisfly to move thru the tubes and pose for the pictures? 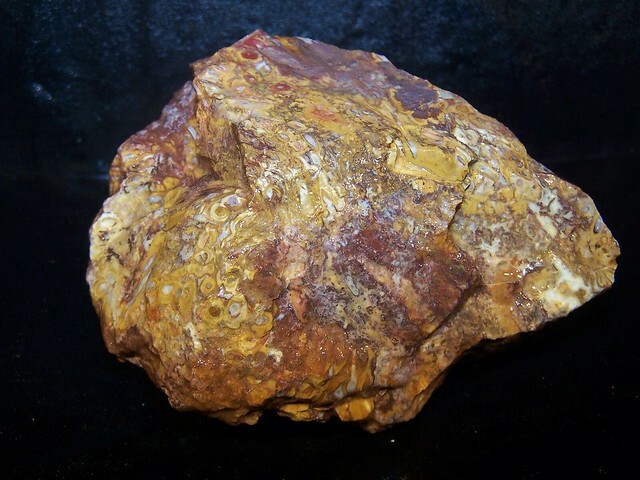 Those private collections are sentimental to most HankRocks fernwood . The owners don't like their prized finds serving as door stops. Oh yes. Showing completed items helps a lot. All about trust that they will not be thrown in a rock garden or as a door stop. When one finds a person who is willing to share their life long collection with another who understands and appreciates what they have, it is a blessing. Karma from the Rock Gods. That is usually the way it works fernwood. Best to keep than to sell/gift if the item is neglected or not respected by the recipient. jamesp , thank you for the vote of confidence. I just know what I like, and I am always looking. johnw , while I have a very keen eye for finding nice material (and on the cheap, at that! 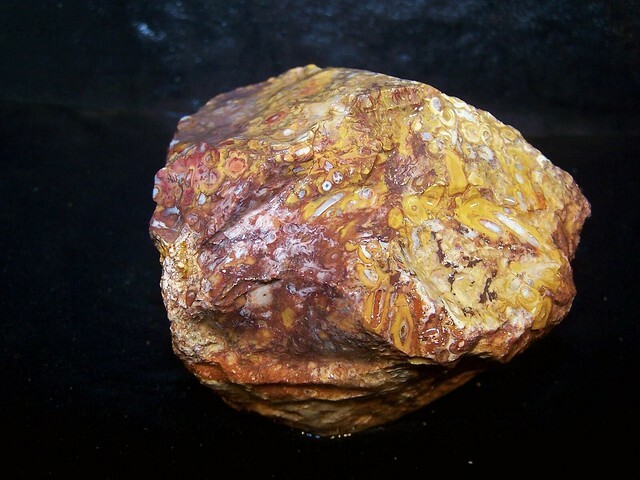 ), I must say that I never purchase rocks on the internet (i.e., eBay). I have never even bought rocks from an RTH member (except from them in person at, say, Quartzsite). I always like to see the products in hand before plopping down the hard earned greenbacks. I buy from the swap meet (where I got the chunk of old stock petrified palm from that I gifted to James), rock club shows and sales, club silent auctions and raffles, ads on Craigslist, and probably most importantly, the aforementioned estate sales. The estate sales I have been to within the last ten years or so have been local people, that have self collected widely throughout the western states (and then some). They don't have a lot of rocks imported from around the world. I have not seen anything as lovely as your Indonesian palm. Not to say domestic stuff is junk, I picked up a slab each of myrickite and howardite. Have also gotten Rainbow ledge rough. Looking through nice rough that has been collected along time ago, brought home, and stored for 20-30-40 years can be such an adventure. I have dug through rusty 55 gallon steel drums, pulling out old leaves, pine needles and rat droppings. Some collections somewhat organized, others - eh, not so much. Chances are, if most of the drum is obsidian, then that's what you'll find. But, occasionally, some different kinds of stuff slip in. Surprise! There is so much stuff collected over the years from places either mined out, or no longer open to collecting, sad to say. So as not to get your hopes up, let me say that I don't foresee myself buying anything from another continent, let alone from out of the country. Just isn't going to happen. But as I have mentioned, should I ever see some that someone else imported, then wanted to sell cheaply, I'll be right there. That is usually the way it works fernwood . It will find a great home. And served you well as conversation piece. And learning experience. 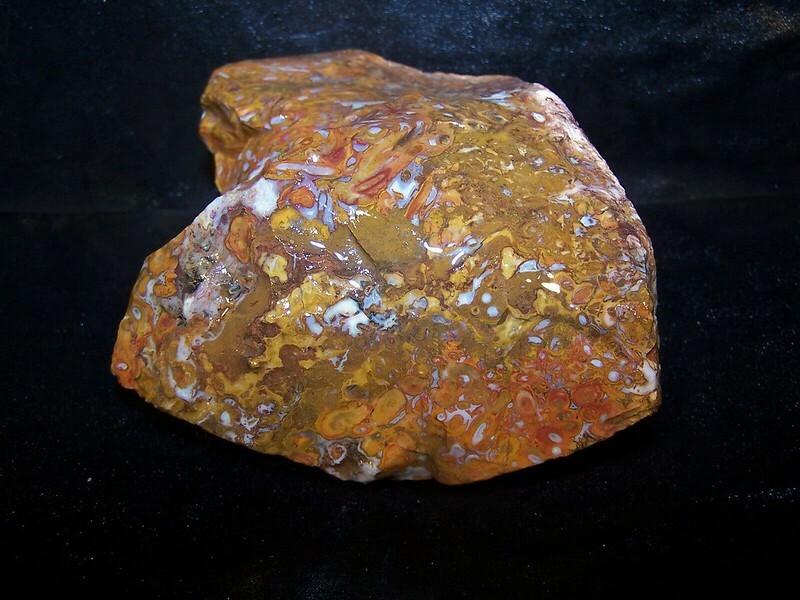 One day rockpickerforever will find a mother load of some fine material being she collects in agate territory regularly. Imagine being able to own a piece of land that had tons of some fine agate that you could mine at will. Like 100's of acres of this fine palm root you guys have been discussing in this thread and could sell it for big profits. And of course keep the best for yourself. Make enough money to buy the best lapidary equipment. Saw and lap giant slabs. Nice dream. 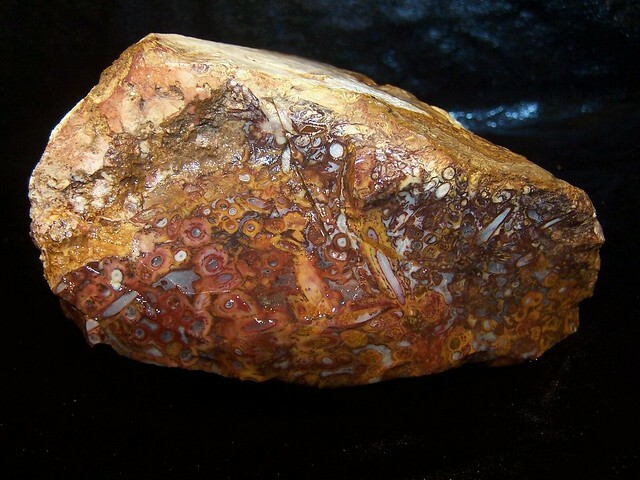 What would it be like to own the Petrified Wood National Forest for example ? Check out this guys resume and adventures. It seems he needed more resources to set up an import arrangement. See his stay in Indonesia and the challenge to obtain fine rocks. Bottom of page has specific links. I no longer WTB since I have located what I was looking for so have moved the thread to Specimen Photos........and now, more "Eye Candy" coming up. 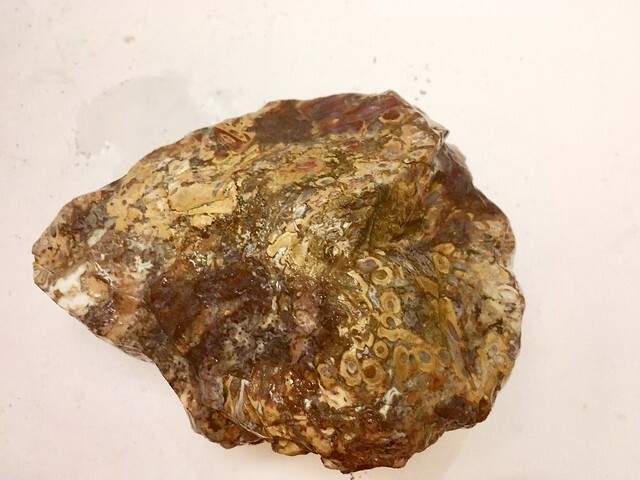 EC2 Weighs in at 2#-0oz Dims are:3.5"x4.5"x2.5"
Maggot Agate... I don't think so.... Eye Candy, decidedly yes. But then, that's just my opinion. Good luck with EC2. Nice arrangement using the half gallon tumbler and surrounding it with ceramics. I shaped similar sized rocks in similar sized tumblers but polished them in a large vibe(cheated). 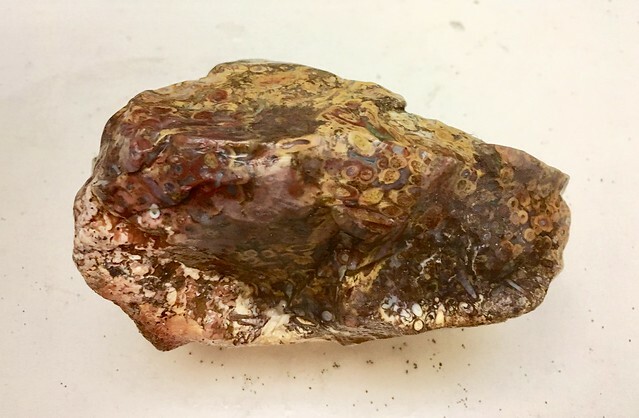 If using small agate media say 1/2 inch in size the shaping took much longer than using 1" to 1 1/2" agates both with 6 pound barrel and 1 to 1.5 pound rock. And when using 3mm garnets as media the shaping speed dropped to near zero on the big rock. So the smaller the media the slower the shaping on the big rock. 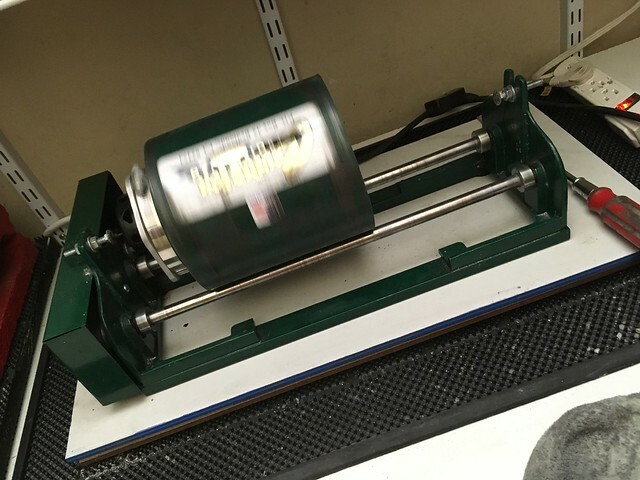 Small media creates less grinding force and more padding, simple as that. That guy in the link is an animal. Sure would be nice to have your youth and the resources to make such trips. jamesp : Hi James, thank's for that inside information. I am using about half and half on the ceramics, small and large, from the Rock Shed. I did not use any agate fill. 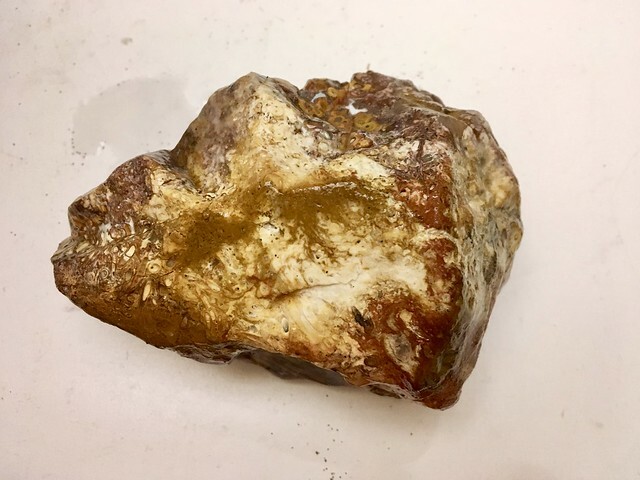 I have a bucket filled with multiple sizes of ceramics used in 60-90 and 120-200 phases and a ton of smaller agate stuff that did not pass muster and will use this as fill in the 65T barrel that is now dedicated to rough phase only using 46-60 grit. I will use the 65T barrel for all the rough work on the Big Crazy's and the 40T barrels on the balance of the phases thru polish. I am pretty much committed to rollers since I traded in my UV18 vibe against the Diamond Pacific. I know it takes longer, but who is in a hurry? I will check the EC2 in a week and make changes as needed. Just as an aside, the noise from the Covington is a swishing sound as opposed to the regular tumbling noises coming from the 40 and 65T barrels that currently use Bahia's as fill. Looking forward to a progress report. Since EC2 is similar in size and my 6 pound barrels I am anxious to see how you do with the ceramics. 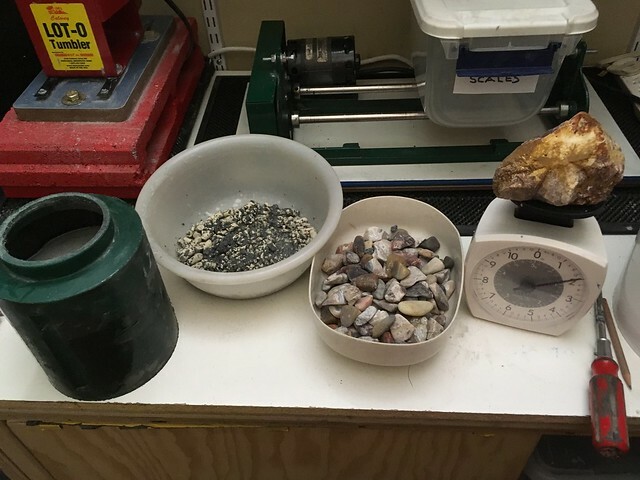 I only ran 2 weeks in coarse because I did a 20 to 30 minute pre-shape to the 1 to 2 pound rocks using diamond wheels so comparison is clouded. Basically the coarse tumbling grit was only removing the scratch marks from the 7" diamond tuck wheels. Then 10 days in SiC 220 to full breakdown. Then 4 days in vibe, 2 w/AO 220 and 2 w/AO polish. 2 rocks/vibe run w/divider. So 14+10+4 = 1 month but 5 rocks running, one in each six pound barrel. This schedule was reduced to 3 weeks by nipping times in coarse using a lap to smooth scratches from tuck wheel and 7 days in SiC 220. And 5 barrels of 1 1/2" agate media that were passed down in SiC 30 and SiC 220 to the next set(s) of big rocks till they were shaped. These 'media' agates shaped surprisingly fast when run with the single big rocks and were some of my best and quickest shaped tumbles ever. I stopped the EC2 tumbling process because it just did not sound right. 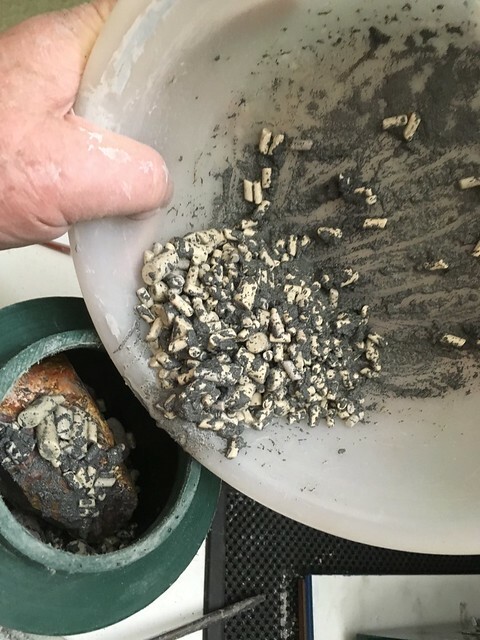 I discovered all the small ceramics and grit had congealed on the bottom of the barrel and, while to be expected after one day there was no slurry, just gritty water. 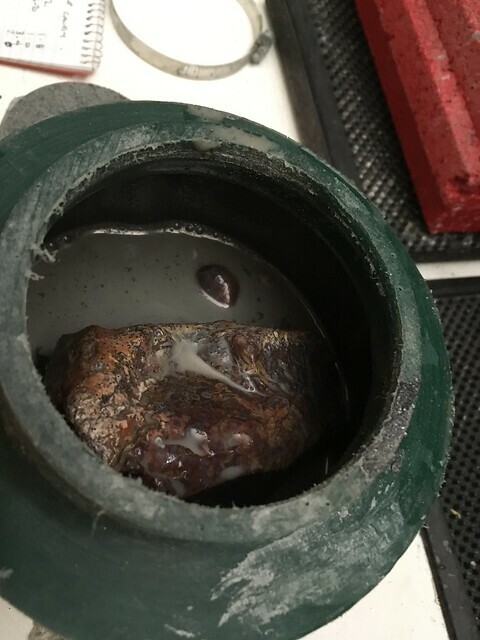 I dumped the grit and ceramics and flushed the barrel, tossed 3 pounds of grit and ceramics and replaced it with 3 pounds of small 1"-1.5" agates and media as advised by jamesp . for which I thank you James, and added back 1 pound new grit plus about 12 oz of old grit and small ceramics plus water. I did discover the weight of EC2 was not as advertised at 1#8 oz, it was 2 pounds on the nose. Buttoned it up and started tumbling. The tumbling sounds like normal. As to EC2, err, well sad to say, is not quite eye candy anymore, but it's got some interesting visuals of the surface. Here are images of how it went down. Images follow. All ready to button up. Back in business tumbling, ahh, the sound it right. Those Covington barrels with the quick cap are the ultimate tumbling barrels for big rock tumbling because the big rock makes SiC grind quick and shapes quick. A 1 pound+ rock in a barrel this size is a super grinder when tumbling tough agates. Not advised for obsidian. Making say 1/2 dose grit additions in most cases every 2 days and thinning slurry by pouring some off and adding water more often. That is a high end tumbler and Covington has their act together. Pretty sure they use HDPE barrels which is next to only rubber in wear resistance. High end tumblers and Covington has their act together. They have been my mentor in tumbling methods with their emphasis on adding instant slurry thickener. I am curious about this tumbler's rotation speed. Coarse SiC is notorious for settling if you do not have 1) a fast spinning barrel say +35 to 40RPM for ~6 to 7 inch barrel or 2) clean water slurry. Simple solution for grit settling for slower spinning(less than 35RPM) barrel is adding slurry from your 65 or adding about 1 to 2 cups clay or kitty litter at start up. 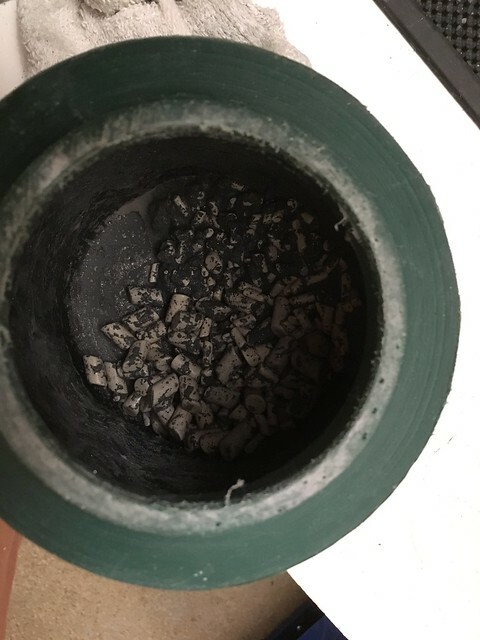 Once your slurry is developed and maintained the settling issues should disappear.